Nissan has invited the public to see it's latest concept, the Nissan Invitation hatchback at the 2012 Geneva Motor Show. The Invitation Concept and the Hi-Cross Concept seem to be Nissan's main draws at the Geneva Motor Show this year. The Nissan Invitation should be arriving in dealership showrooms sometime in 2013. (It will be launched in Europe most likely first.) This will be Nissan’s next generation compact car, a mainstream B-segment contender. The Invitation will be sold alongside the Micra city car and innovative Juke Crossover SUV. The Invitation has an energetic design, bringing fresh style, innovation and excitement to the mainstream hatchback market. The overall design and silhouette of the car are very appealing. The side of the car is dominated by a distinctive character line, known internally as the ‘Squash Line.' This adds a powerful dynamism to its profile with distinctive sculpted front and rear wings giving Invitation a muscular and confident stance. Hopefully Nissan will stick with this overall design for the production version. They might want to avoid making it to reminiscent of other hatchbacks on the market, which tends to happen a lot nowadays. The interior has a refreshingly open cabin that combines practicality and modern features with impressive levels of quality. "The name we have given to this concept is self-explanatory... the key benefit of this compact car is to be inviting.” said François Bancon, Deputy Division General Manager of Product Strategy and Product Planning Division. "It is inviting thanks to its sensuous exterior design and generous and comfortable interior space, cleverly packaged within compact overall dimensions. 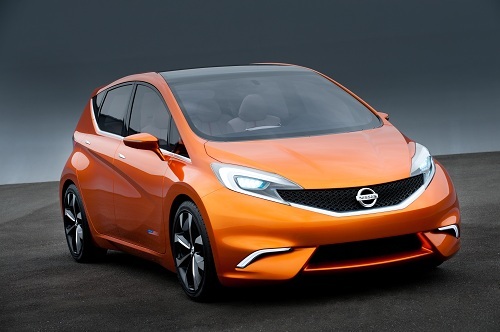 It is Nissan's invitation to buyers in the compact hatchback segment." Using advanced engine technology, Nissan's acclaimed lightweight platform and an aerodynamically efficient body, Nissan claims the Invitation will achieve class-leading levels of fuel efficiency and emissions. At the same time, responsive agile handling will ensure that when it comes to driving dynamics, the Invitation will compete with the top performers in the segment. The concept will pack some of the most advanced technology ever seen in the B-segment, all of which is designed to ensure the car is as safe as possible. Among the features is Nissan's advanced Around View Monitor (AVM) safety technology (rear back-up camera.) Obviously this makes reversing and parallel parking as stress-free for the driver. In addition, Invitation also incorporates Nissan Safety Shield Technologies, which interact with the driving environment keeping the driver aware of what is happening around the car. The Invitation will combine the energetic exterior style, thoughtful interior, advanced safety features and class-leading emissions, fuel economy and dynamic performance that Nissan has come to be known for. I think women with an English/Australian accent are hot.